Are your front teeth chipped? Are you wondering how to fix them or what can be done to prevent them from chipping any further? We have the answers for you!! The patient whose photo is above is absolutely thrilled with the success of her bonding on her front two teeth as well as her Invisalign treatment. 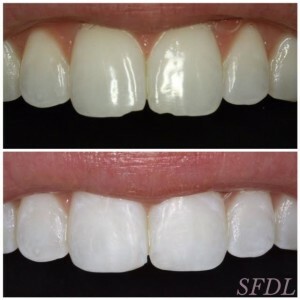 Her final results will be in a future blog to show her new gorgeous smile! If you or any one you know have a similar situation, Dr. Emery would be happy to have a consultation with you and go over your options, as every case is different and there are often several different scenarios or treatment options that you can choose from. At Sugar Fix Dental Loft, you will receive completely personalized care in a spa-like setting with state-of-the-art technology. You will LOVE it here and we will take excellent care of you!! Contact us now.